We build a plan of care based on your needs and expect you to come in the number of times per week as specified. For a regular chiropractic visit, you are generally in and out in about 15 minutes. We schedule our appointments to provide you with the best service. Something come up? No problem! To make it as stress-free as possible, we are happy to accommodate walk-in appointments as well. Please note that our previously scheduled appointments will have priority, so there may be a slightly longer wait for walk-ins. 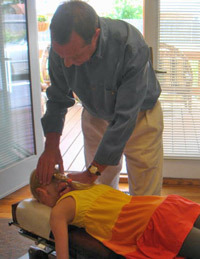 During a regular visit, Dr. VanDehey is shown here adjusting one of his practice members. Dr. VanDehey may use different chiropractic techniques. He will check you for Vertebral Subluxation Complex, and for subluxations of the extremities. Then he will adjust you and make sure that you are clear of subluxation. Done! If you’ve been to other chiropractors, you may have experienced the same technique, even the same adjustments, day after day. Not here. We expect, and you should expect… change. Every twelve visits or so, Dr. VanDehey will conduct a Progressive Exam, to monitor your progress on an objective basis. If his approach needs to change, he will change it. He will help you! Call VanDehey Chiropractic Health Center today and start living the chiropractic lifestyle!